Soon after the construction of Nemesis in 1994, work began between Alton Towers and Bolliger & Mabillard to create the roller coaster that everyone thought impossible. 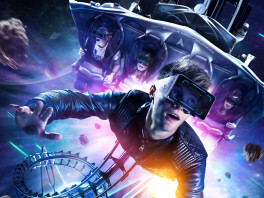 Originally conceived to be unveiled at Alton Towers in 1998, the design of the ride became so complex, that it was postponed, and Oblivion was designed and built ready for the 1998 season instead. The site for the coaster occupies the site previously held by the New Beast ride, which was removed in the late nineties in preparation for site works to begin. Construction work began during the 2000/2001 closed season with basic ground work being done with the wet weather turning it into a large area of mud. By December 2001 the ride circuit had been completed and trains delivered. Initially Air experienced a lot of teething problems, but the ride's reliability is now much improved. As you enter the station area you can see just how complex the systems are, like a huge Meccano set. The familiar queue bays are there, labelled as "air gate 1" and so on. You climb into the comfortable seats and pull down the slightly unusual restraints, flaps securing your legs in place at the same time. Then the rows are smoothly tilted into the flying position whilst the station lighting changes from the bright white to a deep purple and a voice says "prepare for air… assume the position… now FLY!". At this point you notice how comfortable the restraints are, you can totally relax and feel perfectly safe and secure. You move through the first tunnel quite quickly and up onto the lift hill. The ground gets further and further away, you crest the lift hill and your flight begins. A small drop gives the train a bit of speed and you fly round a highly banked 180 degree turn before heading back up again and diving round down to the ground. There's some fabulous floaty airtime on this drop. After the close encounter with the ground it's back up into the sky for the first twist of the ride, you're flipped onto your back and dive down towards the queue line, just feet away before a swooping climb over the queue entrances. Then by surprise you spin back round onto your front and through the second tunnel, once again you can almost touch the ground at this point, straight out the tunnel and into a tight 180 degree turn, then you're spun right round in the final twist on the ride. For the finale you head behind the mound and perform a rather spectacular helix before hitting the brake run. Air is a unique experience that makes a refreshing change to the usual "scary" coasters such as Nemesis and Oblivion.